A second half fightback was needed to earn Premiership side Kilmarnock victory over a battling Clyde in a thrilling Betfred Cup clash at Rugby Park. Jim Chapman's side led 2-1 at the interval but three second half Killie goals and a red card for Jordan Stewart put paid their hopes of causing a cup upset. The home side took the lead after just two minutes when Rory McKenzie fired a low shot past Blair Currie. But the Bully Wee came storming and two goals in the space of just over a minute put them in front. Darren Ramsay levelled on 10 minutes with a fine finish after David Goodwillie's set up. 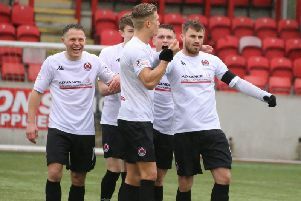 Skipper Kevin Nicholl then headed home a Darren Miller free-kick to put Clyde on course for a second successive Betfred win following their opening day success over Annan. But Dom Thomas levelled for the Ayrshire side seven minutes after the restart with a shot from the edge of the box. Thomas, a summer signing from Motherwell, then put Killie ahead on 59 minutes with a strike from similar range. Clyde battled hard to try to get back on level terms but it was Killie who scored again through McKenzie midway through the second period. Any hopes of a Clyde comeback were ended by a controversial straight red shown to Stewart after he missed a sliding tackle in the middle of the park, but despite the defeat Chapman and his players can take plenty of positives from their display.